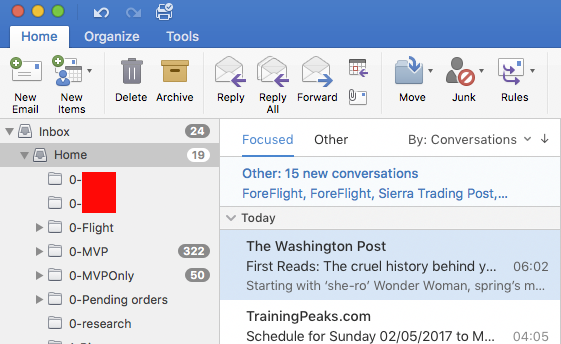 About two and a half years ago, Microsoft rolled out a new mail-sorting feature called Clutter. It was intended to use machine learning to filter important mail from newsletters, shipping notifications, and other… well, clutter, leaving your inbox filled only with mail that required your attention. It was a great idea, and, although it had a few bumps in its implementation, soon evolved into a useful and dependable feature. Now Clutter is gone, and Focused Inbox has replaced it. How’s that working out so far? I use three primary clients: the Outlook Mobile client for iOS, Outlook 2016 for Windows, and Outlook 2016 for Mac OS X. I mostly use the mobile client to triage mail while away from my desk– I can quickly respond to important items and delete or file stuff I don’t need. In that role, I’ve been depending on Focused Inbox for a while, and I got used to the disparity between what I’d see on the Focused tab on my phone versus what showed up in my inbox– the desktop inbox showed all my messages, not just the Focused ones, but that wasn’t a big deal, as I was usually grooming my inbox by throwing away or otherwise dealing with the contents of the “Other” tab frequently enough to avoid ugly buildup. When your tenant’s enabled for Focused Inbox, OWA and Outlook for Mac will display a prompt telling you so; when you click to acknowledge it, you’ll see the new Focused and Other tabs in the UI, just like in the mobile app. Here’s where the fun starts. First up, Clutter is turned off when you accept that prompt, and it’s turned off permanently… so every message formerly filtered into the Clutter folder now goes straight to your inbox. That means you’ll get a notification (if that feature’s enabled) for each new message, much more frequently than you’re probably used to. I’ve long had mail notifications turned off on my phones, but now I have to turn them off on my Windows machine too. This to me is a significant loss of utility. It’s a complicated problem, to be sure; trying to figure out the right behavior for a mix of accounts (some with Focused Inbox, some without) is tricky. I hope the Mac Outlook team is working on a solution. 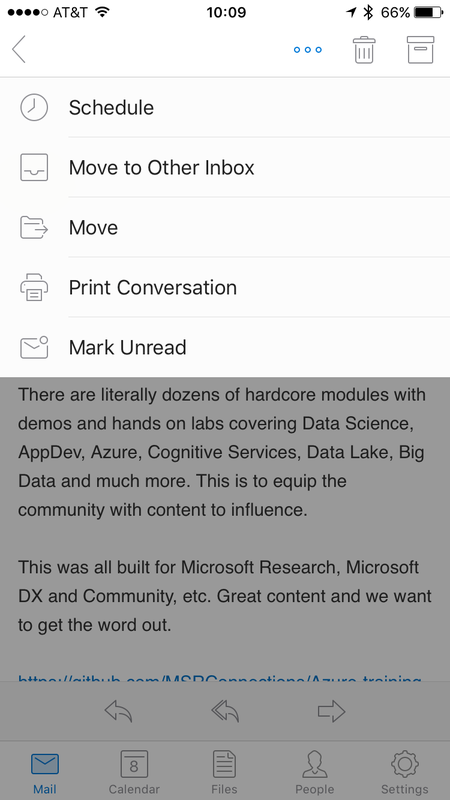 With these gripes, you may believe I’m down on Focused Inbox as a feature. I wouldn’t say that’s true. It is useful, and it has tremendous potential, especially when coupled with other machine-learning-driven filtering and prioritization capabilities. But the current client-side implementation takes away some of the utility we had with Clutter, and I want it back. Hopefully we’ll see not only a return to feature parity, so that all my unwanted messages stay tucked out of sight, but improvements that make Focused Inbox clearly superior. Do mailbox quotas matter to Outlook and OWA? Is there a backend DB reason for setting quotas at a certain size? I have found several links (like this one) discussing the need to set quotas due to the way the Outlook client handles large numbers of messages or OST files, but for someone who uses OWA, does any of this apply? The quota mechanism in Exchange is an outgrowth of those dark times when a large Exchange server might host a couple hundred users on an 8GB disk drive. Because storage was so expensive, Microsoft’s customers demanded a way to clamp down on mailbox size, so we got the trinity of quota limits: prohibit send, prohibit send and receive, and warn. These have been with us for a while and persist, essentially unchanged, in Exchange 2013, although it is now common to see quotas of 5GB or more on a single mailbox. Outlook has never had a formal quota mechanism of its own, apart from the former limit of 2GB on PST files imposed by the 32-bit offsets used as pointers in the original PST file format. This limit was enforced in part by a dialog that would tell you that your PST file was full and in part by bugs in various versions of Outlook that would occasionally corrupt your PST file as it approached the 2GB size limit. Outlook 2007 and later pretty much extinguished those bugs, and the Unicode PST file format doesn’t have the 2GB limit any longer. Outlook 2010 and 2013 set a soft limit on Unicode PSTs of 50GB, but you can increase the limit if you need to. Outlook’s performance is driven not by the size of the PST file itself (thought experiment: imagine a PST with a single 10GB item in it as opposed to one with 1 million 100KB messages) but by the number of items in any given folder. Microsoft has long recommended that you keep Outlook item counts to a maximum of around 5,000 items per folder (see KB 905803 for one example of this guidance). However, Outlook 2010 and 2013, when used with Exchange 2010 or 2013, can handle substantially more items without performance degradation: the Exchange 2010 documentation says 100,000 items per folder is acceptable, though there’s no published guidance for Exchange 2013. There’s still no hard limit, though. The reasons why the number of items (and the number of associated stored views) are well enumerated in this 2009 article covering Exchange 2007. Some of the mechanics described in that article have changed in later versions of Exchange but the basic truth remains: the more views you have, and/or the more items that are found or selected by those views, the longer it will take Exchange to process them. If you’re wondering whether your users’ complaints of poor Outlook performance are related to high item counts, one way to find out is to use a script like this to look for folders with high item counts. Circling back to the original question: there is a performance impact with high item count folders in OWA, but there’s no quota mechanism for dealing with it. If you have a user who reports persistently poor OWA performance on particular folders, high item counts are one possible culprit worth investigating. Of course, if OWA performance is poor across multiple folders that don’t have lots of items, or across multiple users, you might want to seek other causes. Although I’ve been working with Outlook for Mac for quite some time, there are lots of its features that I don’t use. Because all my mailboxes are hosted on Exchange, for example, I don’t ever use any of the IMAP functionality. In the same vein, because all my calendar and contact data live on an Exchange server, I haven’t had to fiddle with calendar sync for some time. I used to sync my calendar with various Palm devices back in the day using Entourage, Outlook’s predecessor, but it was always a painful and error-fraught process, and I was happy to move to an all-Exchange, all-Exchange ActiveSync environment. A friend and fellow MVP mailed me with a Mac Outlook calendar sync question, and I didn’t have the faintest idea of what the right answer was. Accordingly, I dragged a third MVP into the fray: Mac/Windows interop expert William Smith. He came up with a workable solution, and as a bonus he wrote a detailed tutorial on how to set up calendar sync. That got me to thinking about the differences in the Outlook brand between Mac and Windows. The functional differences have been discussed at length elsewhere (like on Steve Goodman’s excellent feature comparison table.) As Steve points out, the Mac version of Outlook feels much like Entourage. Although the user interface has been revamped, and is much more pleasant as a result, many of the same issues that plagued Entourage are still around. For example, I’m running Outlook with 3 Exchange accounts on a MacBook Pro with a 2GHz quad-core i7 and 8GB of RAM. This is a snappy machine… and yet Outlook still frequently takes leisurely breaks to show me the spinning rainbow when I click on messages, and it often gets confused about exactly which messages are, or are not, part of a given conversation. That’s not to say it’s more or less buggy than Windows Outlook, which of course has its own set of issues. I use both on a daily basis. There are some things that Mac Outlook does better; for example, I love having a single unified inbox for all my accounts, and the integration of Outlook with other apps (like iPhoto) is better than it is, in general, with Windows counterparts. On the other hand, I find it much easier to work with the schedule and calendar views in Windows Outlook; I really like the Outlook Social Connector, and the “Ignore Conversation” and QuickSteps features are both super valuable for plowing through large volumes of mail. I find Apple’s Mail.app weird and unsatisfying: it doesn’t include all the data I want (like calendar and contact info), and it doesn’t do many of the familiar things that I expect from the Outlook family. That would be OK if Mail provided a better experience than Outlook but in my judgement it doesn’t– I’d rather use Windows Outlook in a VM than the native mail app. In that light, rebranding the Mac client as Outlook has been a success: Outlook users on either platform will find familiar things to like (and perhaps to gripe about) on the other platform. Throw OWA into the mix and overall I’d say that Microsoft has done a good job of building consistency between the platforms. There are still some major differences between platforms. For example, Outlook 2011 has little to no SharePoint integration; it lacks proper conversation threading (plus the aforementioned QuickSteps and “Ignore Conversation”); it doesn’t integrate properly with Exchange UM, there’s no Personal Archive access, and it doesn’t support VBA (although its AppleScript support is quite extensive, and much improved from Entourage). Most users, of course, will use whatever version of Outlook happens to run on their preferred platform. That’s natural enough. Overall I’m quite satisfied with Outlook 2010 (well, except that for some reason 64-bit Office Communicator hates it). I’m hoping that the Mac Office team can address some of the performance and behavior issues in Outlook 2011 in the forthcoming Service Pack 2. I’m not as concerned about missing features, as those will come in time, and the Mac team has the benefit of seeing what features in Outlook 2010 are actually worth porting and which ones are not.